Join us for a Triduum in honour of Our Lady of Lourdes as we pray for those suffering because of illness and for those who care for them on Saturday 9th at 12 Noon, Sunday 10th at 12 Noon and Monday 11th at a special Mass at 12 Noon. St Anthony had a special care for those who were sick and suffering. 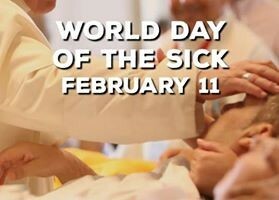 On Monday 11th February, the feast of Our Lady of Lourdes the church asks us to pray for all who are sick.